The castle was built in AD1071 by Robert d'Oilly and was a royal property until 1611. It originally had a mound, around 64 feet high, later topped by a stone keep and surrounded by outer walls and towers. By the late 18th century, the keep had been destroyed and replaced by a ring of decorative trees on top of the mound. 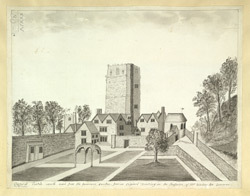 St George's Tower, which can be seen in the drawing, was the only remaining tower of the curtain wall. By this time the usage of the castle had also changed: the county assizes met here and the remains of the castle served as the county gaol.